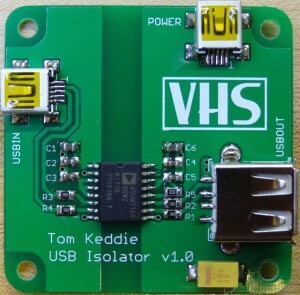 This is the PCB from https://github.com/TomKeddie/vhs-pcbs/tree/master/usb-isolator. No components are included, PCB only. I've had some requests over the years for an isolator with inbuilt power supply. Adafruit did such a design last year, the parts cost is about twice this design. 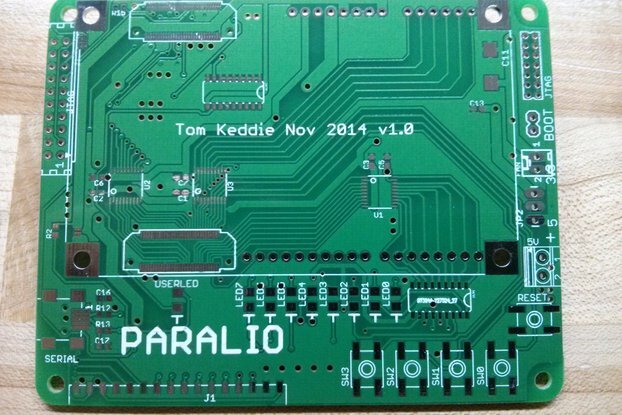 I have pcbs from their design for sale here - note that the supply is also 100mA only. 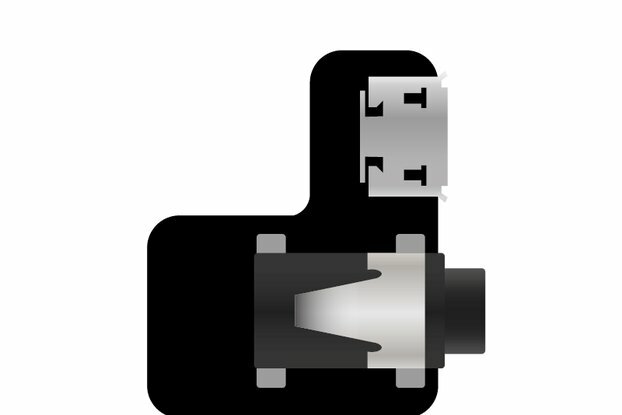 The supply in this design is limited only by the current available on the power usb connector (a max of 2A is probably safe). In one of the earlier SMD workshops I've running at VHS I managed to temporarily kill my new macbook pro when I plugged in a participant's prototype. 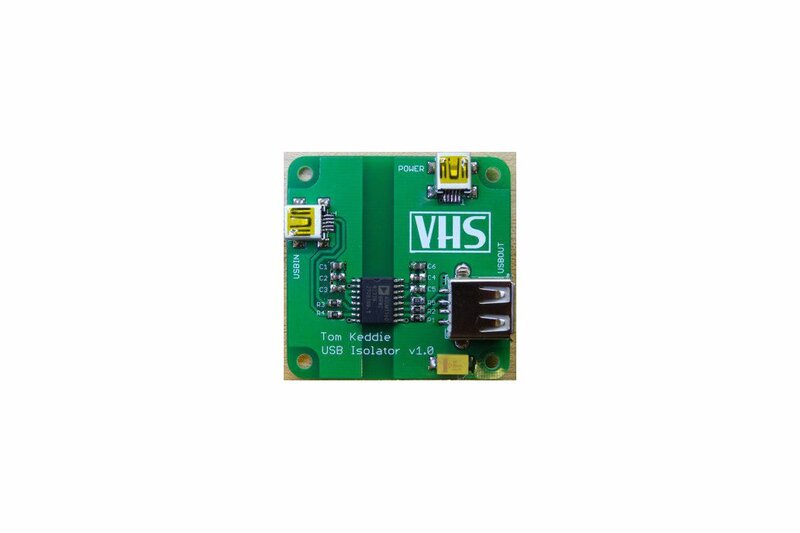 I revived it by removing the back cover and disconnecting the battery all the time chanting to myself, must get a usb isolator, must get a usb isolator, must get a usb isolator….. 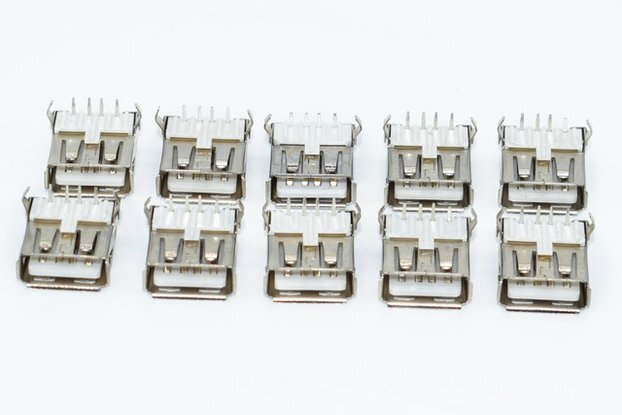 This is a nice simple soldering project that does exactly that, isolates your USB port from connected devices. There are two input usb connectors, one carries data and power from the computer the other supplies power to the output. The output comes from a 3rd USB A connector. There is no power/ground/data connection between the computer and connected devices other than through the isolator chip. This board has two grounds, two power supplies etc. I did manage to get some samples from Analog Devices. We’ll be getting the ADUM3160 from Farnell/Element14, you can see more details on the isolator chip at their page. The ADUM3160 isolator chip is limited to 12Mbps speeds, which are fine for development boards like Arduino etc. Now shipping RED rev 1.2 of the board. Updates were adjustment of the mounting holes for the USB A socket to make the part easier to mount and addition of power LED indicators to both power supplies. All the documentation on github has been updated. Ordered a month ago and never received the boards. Ordered a month ago and never received the boards. Ordered a month ago and never received the boards. Update September, something was wrong with the initial address you supplied, I got your boards back return to sender, I had to pay for both the outbound and return postage. Please change your rating. Update 5 August, tracking shows the replacement for your order was delivered today, I'd appreciate it if you can update your order. I've sold nearly 100 of these boards now with no complaints. Thanks for making contact, this is the first I've heard from you. After an appropriate time I generally replace lost orders. The only order I've ever replaced was received twice in the end and everyone was still happy. A bad review is something that you'd give after poor customer service, next time please give me a chance to respond. I'll look at your order now, we've has labor disputes in the postal service up here so it might have been delayed. First surface mount project I assembled and had no problem . The product work as expected . Thumb up for using Sick of Beige footprint. 4 Star for shipping because no tracking number was provided but I did get it fast. Thanks for the review Olivier. I could provide tracking but I'd have to charge for the extra cost and the time it takes me to line up at the post office. People wouldn't pay it. Great quality and good documentation. Tom, next version with isolated DC-DC (5V-5V) converter please!